OSWEGO – The officers, advisory board members, and volunteers of the Oswego County Salvation Army Corps offer thanks to everyone that participated in the third annual Red Kettle Golf Tournament held recently at Battle Island golf course. 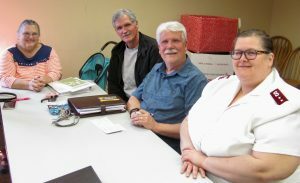 The committee planning the third annual Salvation Army Red Kettle Golf Classic at Battle Island State Park Golf Course, shown at a recent meeting, includes (from left) advisory board member Carol Dexter, advisory board vice chairman Ned Waterbury, advisory board chairman and tournament chairman Tom Brown and Salvation Army Corps Captain Heather Odom. There were 72 players in 18 teams and they raised $5,000. In addition to the players, thanks also go to Kristen Aluzzi, manager of the golf course and to the businesses, organizations, and individuals that sponsored holes, contributed raffle prizes, and helped in numerous other ways. The tournament earnings will support the food, clothing, and other services for people in need throughout Oswego County all year long. The Corps will sponsor two more Guest Chef public fundraising dinners this year; on October 16 by the Press Box and November 13 by Canale’s Restaurant. Serving for dining room or take-out begins at 4:30 p.m. at 73 W. Second St. in Oswego. There will be many opportunities to stand with the kettles during the upcoming Christmas season.